When the snow shuffles down the mountains of Abruzzo, arriving at the door to muffle the normal rhythmic daily sounds of village life here under the Corno Grande, it’s almost possible to miss the bread van’s arrival despite the village dogs releasing their existential and territorial yollers, adding to the subtle cacophony of snowflakes, icicles and wintery white-outs that scream “minestra time”. At these times there’s nothing more insulating and reassuring than a big bowl of homemade soup, even better when it’s a healthy one like Beetroot & Farro, sustaining and nourishing you with a chunky slice of freshly baked crostoso (crusty bread). I need to record Italia my neighbour, the Super Cook, just pronouncing the word “minestra”; she could sell soup to the devil the way it rolls off her tongue – beautiful. Farro, a popular grain up here in the Teramo region of Abruzzo, is grown more often than not with an organic stamp and is nuttily delicious, fantastic in its low GI. Perfect those who have blood-sugar and diabetes issues. If you haven’t tried it before, afterwards you will understand why it was such a popular food and given to Rome’s Legions as they marched onwards across the continent. 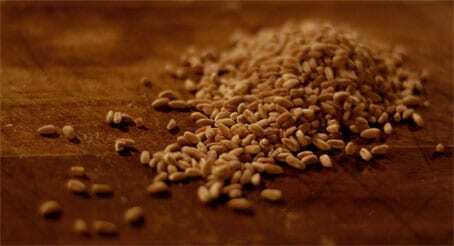 It is an domestic hulled grain wheat, that is more commonly known as Spelt in English-speaking countries – it is NOT emmer. When cooked with beetroot it ends up looking more like jewelled pomegranate seeds than simple grains so this soup should please anyone with a penchant for rocks! Beetroot is high in fibre, Vitamin-C, folate, iron, potassium, all of which work together to keep colds at bay, hence the rather liberal dose of garlic too. My neighbours love crinkly Savoy cabbage, it was one of the things I was surprised to find out about Abruzzese cooking, it’s even fried with wine and eaten as a form of sauerkraut with fegato (liver sausge) in a sandwich. The nicest thing after its taste is that it doesn’t leave any of those lingering odours that some other cabbages reach! Fry half the pancetta with garlic in a large saucepan. Add the chopped pancetta, carrot, potato and beetroot, bayleaf and thyme and sweat for 10 minutes on a low heat. Wash the farro in a colander and rinse several times under running water, then add it to the mixture adding the hot vegetable stock. Raise the heat and bring to a boil, and then simmer over low heat. After 20 minutes add the chopped cabbage and allow to cook for another 20 minutes, stirring occasionally. Fry chopped peperoncini, the remainder pancetta and a chopped tomato together in a frying pan until done. Pour the soup into bowls drizzle with olive oil and the pancetta & peperoncini mixture, serve with crusty bread.